The narrative [i.e. the stories] of struggling everyday ordinary Black, White, Brown, Red, and Yellow people in this nation and throughout Mother Earth, must be told and retold, by we ourselves, in perpetuity. If we do not consistently present our collective narrative, our past and current struggles for social, economic, and political justice will be twisted, disfigured, distorted, and/or omitted by systemic usurpers. In this year of 2013, it is obvious that the struggle for human and political rights in the U.S. has been thwarted by usurpers and systemic gatekeepers and misleaders from the so-called left and the so-called right who are owned by their corporate masters. The end game remains: Keep everyday people distracted, divided, and manipulated. But it doesn't have to be this way. The horrors of COINTELPRO [the infamous U.S. Counter Intelligence Program to 'discredit, frame, imprison, and/or murder' politically active people of conscience] have never ceased continue unabated, and have in fact, been intensified. These horrors, under drone man Barack Obama, have now been legally codified via the Patriot Act, the NDAA (provision 1021), the 'Kill List,' and the ongoing U.S. prison gulag at Guantanamo, etc. The internal and external subterfuge of 'false flag' operations (which are designed by the U.S. corporate / military elite – and so-called 'intelligence' gathering organizations - with the deep complicity of the U.S. corporate-stream 'news' media) to keep everyday people in fear, divided and submissive are at an all time high. The perpetual wars and/or U.S. military incursions throughout the world perpetuates 'terrorism' and is, in itself, state-sponsored terror. The shredding of the U.S. Constitution (at home) and the demonstrated contempt for international law (abroad) by the Obama/Biden regime in concert with his Democrat and Republican cohorts is self-evident to conscious persons. The active militarization by the Obama regime of local and state police departments throughout the U.S. and the enormous arms build-up by the so-called Department of Homeland Security (DHS) is further indication that the United States is not becoming a police state – it already is a de facto police state. Moreover, the ongoing imprisonment and the physical and/or psychological torture of the vast amount of U.S. political prisoners of all colors, languishing in this nation's prison gulag system, is an obscene and continuing outrage beyond description. And the U.S. 'justice' system is an integral part and parcel of this obscene outrage. Human and political rights in the U.S. is an utter farce. And it will continue to be such until everyday people collectively say, “NO MORE!” and systemically CHANGE IT! So where are the so-called 'liberals' and 'progressives' as all of the above outrages are being carried out by the Obama/Biden regime? Where is the mass outrage from these segments that was so prevalent during the Bush/Cheney regime? Much (if not most) of the leadership of so-called 'liberals' and 'progressives' in this nation are deafeningly “silent,” and therefore deeply complicit, in the perpetuation of these outrages at home and abroad. This leadership, or more appropriately described – this misleadership, are the fifth-column systemic gatekeepers for the continued political, economic, and social emaciation of everyday ordinary Black, White, Brown, Red, and Yellow people in this nation and abroad. They are, in reality, worse than hypocrites. 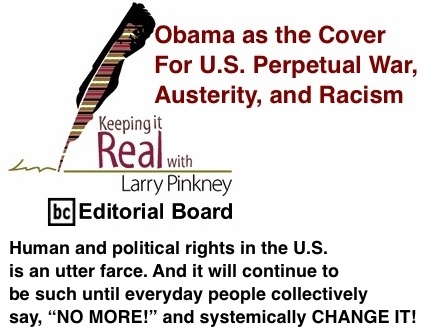 Hiding under the fallacious cover of Barack Obama and so-called 'political correctness,' they are in fact perpetuating austerity and racism at home, and perpetual war, torture, and terror abroad. They are the willing color and/or gender token-puppets for this deranged, blood sucking corporate-owned U.S. political system. These privileged so-called 'liberals' and 'progressives' know full well that human rights inside the U.S. itself is a well perpetuated fraud from which they benefit by pretending to be the guardians of, in real terms, virtually non-existent human and political rights in this nation. They obfuscate and distort the narrative of everyday people's struggles. They too, are usurpers of the people's struggles. There are no words to adequately describe the pernicious and insidious role that they play and the enormous harm that they perpetrate upon millions of everyday ordinary people. The very last thing that the misleadership of the so-called left and right want to occur, is for the ordinary everyday people of this nation (and world) to directly communicate with one another, identify our common interests, and collectively throw off our political and economic yokes. We, the everyday ordinary people of Mother Earth, already know that we should expect systemic pawns to use every dastardly tactic at their disposal to thwart and 'neutralize' us. But we should also know and remember that we are the overwhelming majority, and by staying focused, vigilant, persistent, and determined – we the people – shall succeed. So, “claim no easy victories,” but do claim the right and necessity to struggle for victories!